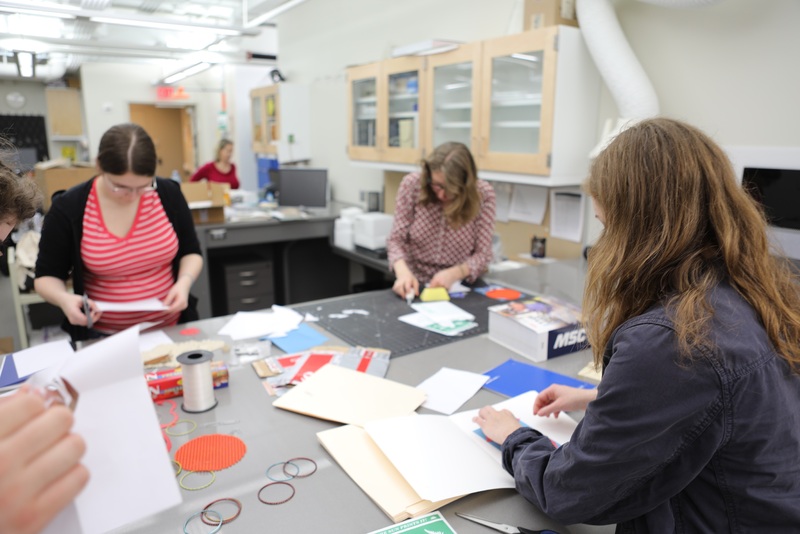 Recently Conservation & Preservation hosted two classes in the Sheridan Libraries’ Conservation Labs for the undergraduate Museums and Society course, Conservation of Material Culture: Art, Artifacts and Heritage Sites. Taught by Professor, and Objects Conservator, Lori Trusheim, the class introduces students to the fundamental aspects of conservation with a goal of understanding how conservation contributes to the technical study of artworks and the role practical science plays in the field. Readings such as “Can a Paper Maker Help Save Civilization”; “A Comparison of light-induced damage under common museum illuminants” (Triennial Conference; 15th, International Council of Museums; 2008; New Delhi); and “The scientific detection of fakes and forgeries” are combined with class meetings held at local museums and conservation studios. Paper Conservator Jennifer Jarvis led a workshop on “Book & Paper Conservation.” Jennifer provided an overview of work done in the Conservation Lab while students were able to handle examples of before-and-after treatments performed by Hopkins conservators. Following the discussion, the group observed Jennifer in working conditions mending tears in paper and demonstrating how paper can be washed. 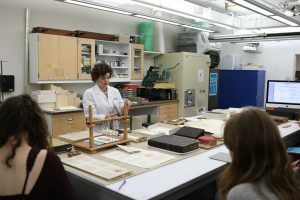 In addition to touring the lab space and equipment, students were granted an up-close viewing of some highlights of the Sheridan Libraries’ wonderful collections. 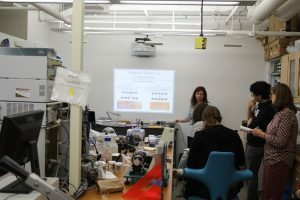 The following week, Andrea Hall, Sr. Research Specialist, and Patricia McGuiggan, Associate Research Professor and Heritage Science for Conservation Principal Investigator, hosted a class on paper science in their area of the conservation labs. 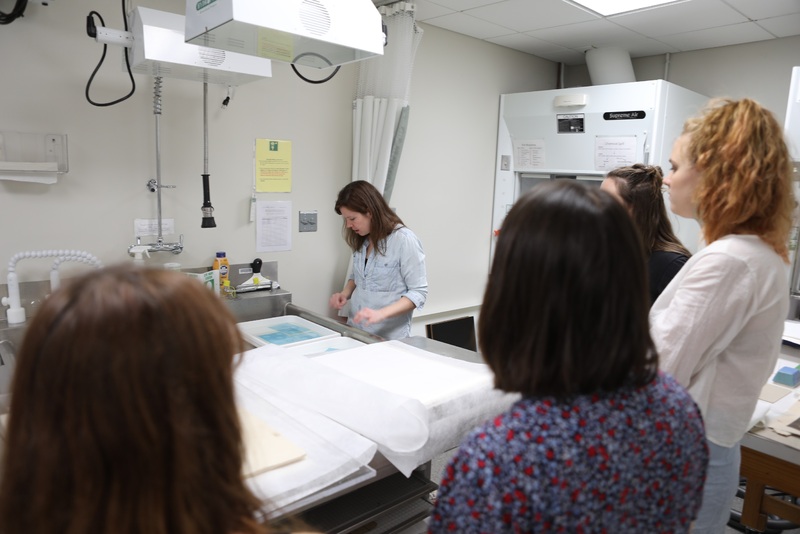 Intermixed with an overview of science’s application in paper research and conservation, students were able to cast their own sheets of paper from pulp and develop Cyanotype print exposures using sunlight. The hands-on application facilitated discussions on the properties of paper and paper-based media and how they can be studied and analyzed by scientists and conservators alike. 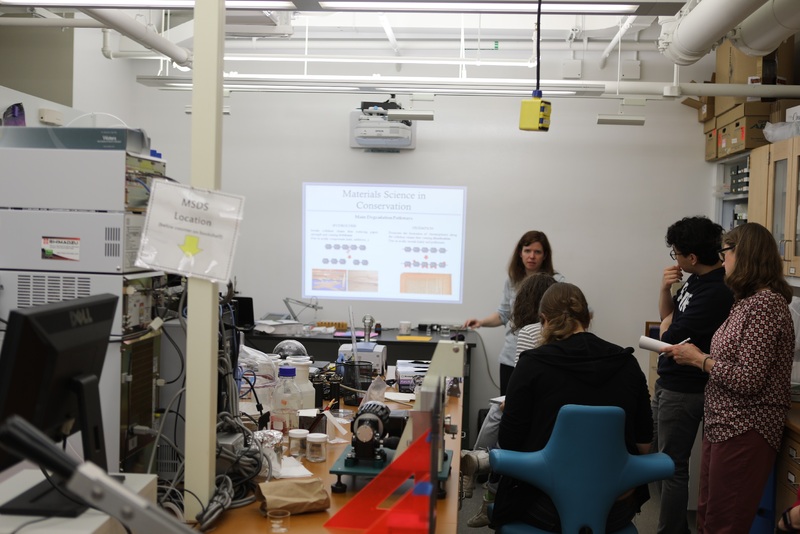 While Patty and Andrea shared some of the current research they are working on, they also demonstrated some of the instruments and equipment they use in their processes and research, and provided a look into the Heritage Science for Conservation’s TAPPI room. The class will be visiting other museums in the future: the Walters Art Museum, the Baltimore Museum of Art, the National Museum of the American Indian and the Homewood and Archeological Museums here at Hopkins.